New this year: we’re streaming the 2013 All America Laughter Yoga Conference! What would the physical, mental, emotional and social impact be of 12 solid hours filled with laughter, inspiration and learning? How do I do this? As the Laughter Yoga movement grows, so does the amount of people hungry for more fun and refreshing ideas. People like variety, no two trainers are the same, and I have many hundreds activities in my dynamic database to meet everybody’s needs (more on this in our next newsletter – it’s almost ready to release to the general public). Each training I offer opens the door to more. Healthy fun is very addictive, yet it’s not so much the fun that people want as it is the personal transformation and self-actualization that is achieved through it because that is what transforms lives and translates into quantifiable $ amounts of benefits (pain and stress are expensive). Read more. Several exciting programs are coming up that you may want to consider attending, starting with the All America Laughter Yoga conference in August in Vancouver. People have already signed up from as far as Australia and Dubai to attend, and that’s not by chance. All laughter conferences are fun, inspiring and empowering. This one is special. Of more immediate interest is World Laughter Day coming up this Sunday 5/5. This a wonderful opportunity once of year for people interested in laughter to get together, share and network. There is a list of events here, and if nothing is listed near you I encourage you to pro-actively contact Laughter Clubs or Laughter Professionals in your community and ask them directly. I will myself be celebrating inLos Angeles, CA. I look forward to meeting and laughing with you! It’s coming and it will soon be here! There are only 6 weeks left before the early bird discount for the 2013 All America Laughter Yoga Conference ends on 6/15. The conference itself is taking place in Vancouver, BC, on August 22-25. Space is limited. Our 2013 theme is “Lessons Learned From Challenges Faced”. We all know that challenges happen but somehow we’re often afraid of them. This is an opportunity to change our perspective. This year we will document and learn from our challenges as individuals and a community in a series of round-table discussions moderated by experts, and use this process to make valuable recommendations to help all succeed and thrive. We will also have “success reports” where we’ll showcase instances where the conscious application of learning from previously reported failures has enabled eventual success. Read 8 challenges that Laughter Professionals have recently faced and what they have learned from it. This conference is as inexpensive as it gets, and it still costs time and money. Is this a wishlist item or a valid investment in you?Listen to Merv Neal explain why he comes all the way from Australia every year. Do you have a phone or computer? We’re streaming the 2013 All America Laughter Yoga Conference! We are offering a streaming feature of the whole 2013 All America Laughter Yoga Conference this year at minimum cost as a service to our community and its members who are unable to travel. Listen to live sessions or watch a recording (19 hours in total). All sessions will be recorded and available online for viewing for 12 months after the conference. Choose your audio: you can use your computer or telephone to join. No headset or microphone required. The sessions will be streamed in listen-only mode and only presenters will be heard. You can ask questions through the chat feature. 100% money back guarantee. We will refund your money in full for 30 days until after the conference if this is not working for you. I have refined the answer to this question over 400,000 miles in the past 8 years, training hundreds of Laughter Professionals both face-to-face and through the very comprehensive Laughter Online University. This summer alone I will teach on 3 continents, from Lima, Peru, to Munich, Germany, via Vancouver, BC and several other world capitals. Everybody knows that laughter is the best medicine, but did you know it’s also a powerful tool for personal transformation and self-actualization? Join me in one of the following locations for either 1 or 2 days of laughter and play. Prepare to streamline the channel between your head and heart and connect to your authentic self through fun, creative and cooperative activities. You will experience and learn a comprehensive, clear and joy-filled methodology that’s grounded in science and cognitive psychology and produces immediate results. From only $95. Space is limited! Can’t come to a training? Then the Laughter Online University is for you. Get a a solid, reliable and up-to-date laughter education (and continuing education!) that’s peer-reviewed and validated. Does it work? We already have over 200 people all over the world who say yes (read it for yourself). This is not a biased opinion. See this as a massive online resource center to help and support your activities in the community, open 24/7/365, from as low as $79, all available on your laptop, ipad or cellphone, with a full 30 days money back guarantee. This is the education of the future, and we’re leading a whole industry by a few years. Bookmark www.healinglaughter.org now. Much value is going to come your way from that platform. Take your laughter practice to the next level! Invest in your own personal development. This is 40 hours of professional education that will take years off your learning curve. There is a wealth of valuable resources on the net (see some examples below). If you would like to learn and practice this kind of activities and many more read this. Have you ever considered organizing a “minute to win it” party? Want more? Follow us on Facebook. We are glad to announce that our online laughter store is slowing going digital in order to serve you better and save you money. The price drop is steep and you can now buy valuable and educational Laughter Yoga videos for as low as $4.95. This includes instant access through video on demand as well as a full video download. This entry was posted in Laughter Insight Newsletter and tagged laughter yoga, world laughter day on May 2, 2013 by Sebastien Gendry. This article details how people around the world are spreading its message of joy, health and world peace through laughter in a variety of projects that include Laughter Clubs, World Laughter Day, Universities of Joy, and more. Laughter Clubs are local gatherings of people who just want to laugh as a form of exercise, and choose to feel good about themselves and the world they live in with other like-minded individuals. While they do not belong to any tradition in particular, they are a primary door of expression for people who practice Laughter Yoga. What is unique about them is that they are all fully independent, not-for-profit, non-political, non-religious and non competitive community-based associations of diverse people who choose to be happy. Everyone is welcome. Each club defines its own meeting frequency. They do not report to anybody, are not told what to do, and do not pay royalties. Laughter Clubs are not limited by language differences. Laughter has no accent. People come together to Laughter Clubs with a common purpose that provides social support. It’s a form of social glue. They provide a sense of belonging and of being involved in a worthwhile cause. Because we have a common method and shared values, laughter club leaders and members form a global network to share ideas and to give each other encouragement and inspiration. Through this network the method improves continuously. New exercises are always being invented and we are discovering necessary cultural adaptations, too. Laughter Clubs promote observances of World Laughter Day (the first Sunday in May). They are intended to be a free, social, community-based initiative of motivated individuals. In 2011 there are an estimated 6,000 Laughter Clubs in over 70 countries on five continents, and there is a rapid growth in countries of Asia, Africa and South America. Click here to find a Laughter Yoga Club near you. Laughter Clubs are a primary force on the ground for peace. The first Laughter Clubs in the Middle East for example were created in 2005 in the countries of two archenemies: Israel and Iran. Today there are several dozens of Laughter Clubs in each of these countries. Here is what happened in Iran. You may remember the riots and massive bloodshed in Teheran that followed a contested election in 2009. What did Teheran’s City Council do in an desperate effort to lighten up the mood in the city when everything else had failed? They sponsored more Laughter Clubs, and it worked. The idea to dedicate one day of the year to laughter as the expression of a desire for world peace came to Dr. Kataria in 1998. The first “World Laughter Day” gathering took place in Mumbai, India, on 11th of January, 1998. 12,000 members from local and international Laughter Clubs joined together in a mega laughter session. 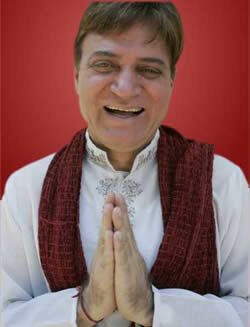 “HAPPY-DEMIC” was the first World Laughter Day gathering outside India. It took place on 9th January 2000 In Copenhagen, Denmark and more than 10,000 people gathered on Town Hall Square. The event went into the Guinness Book of World records. This is a worthy goal with an interesting story that shows how powerful the vision of one man can be. For years Dr. Kataria (featured in the image on the right) has been dreaming of five "Universities of Joy," one on each continent. These are not "academic" Universities but rather educational centers that will provide all the necessary knowledge and comprehension of the rapidly spreading concept of Laughter Yoga. The thing is, he has not just been dreaming about it. He has let everybody know about his dream, wrote about it, shared his vision; over, and over, and then over again with unrelenting enthusiasm. For years many kept telling him that this was a pointless pursuit because such a project would cost a phenomenal amount of human resources and money that he didn’t have – until 2009, that is. In 2009 a wealthy Indian man died and donated enough money to get this project started with the first center in India. Land was bought, an architect hired, and the first steps of the construction started. Inspired, an American philanthropist offered to help and is currently looking for an appropriate piece of land in North America. This project is still on Indian time and much remains to be done before anything is completed. When will that be? The answer is the same as with the timing for World Peace: in due time. When that will be is not Dr. Kataria’s concern. All he does is focus on what he can do in the present moment to the best of his abilities in a spirit of selfless service. For the rest he trusts that what is meant to happen will happen when it’s supposed to for the highest good of all involved. We have all much to learn from such an attitude. Click here to read more about the "Universities of Joy. This is another of Dr Kataria’s dream: a huge ship called SS Shanti (Peace Boat). 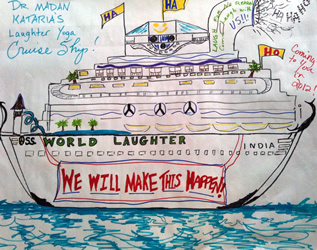 It will sail around the world, connecting different people from different cultures through Laughter. It will have an on-board museum and host Laughter festivals and training programs. The idea behind the cultural exchange program is to give people an opportunity to understand each other’s culture, values and build a strong network of like-minded people who believe in love, laughter, joy, kindness, compassion and generosity. The implementation of this program is still in its infancy and done at this stage by people who either already know one another, or pro-actively contact local Laughter Club Leaders in areas they want to visit. The Laughter Yoga Foundation plans (there is no set timeline) to create community living townships of happy people. Its vision is to have a ‘Laughter City’ on the outskirts of each and every major city of the world. Dreaming does not stop laughter enthusiasts from being active in their community. This entry was posted in About Laughter Yoga and tagged kataria, laughter club, laughter clubs, laughter session, laughter yoga, laughteryoga, madan kataria, world laughter, world laughter day, world peace on May 22, 2012 by Sebastien Gendry. World Laughter Day 2011 was celebrated in an ever increasing number of countries around the world, with more passion and enthusiasm than ever before. This entry was posted in Laughter News and tagged laughter yoga, world laughter day on May 9, 2011 by Sebastien Gendry. Here are a few pictures from the Los Angeles 2011 World Laughter Day celebration. About 40 people came from Camarillo, West Los Angeles, Pasadena, Long Beach and as far as San Bernardino. Twice as many wanted to come but could not due to competing engagements. Laughter Yoga is healthy and strong in Los Angeles. There aren’t many Laughter Clubs at this point in time, but the ones that are there are well established and led by motivated people who have been doing this for several years. This entry was posted in Laughter News and tagged laughter club, laughter yoga, world laughter day on May 1, 2011 by Sebastien Gendry. On the 25th March Laughter Yoga Australia in conjunction with the Make A Wish Foundation held Laugh for Kids day. This was held at venues around Australia. The one that I was involved with was GRRREAT and attracted lots of positive media. A sample of this can be found at the following link. http://media.theage.com.au/how-laughter-can-be-the-best-medicine-2252104.html?from=newsbox It’s interesting nowadays with technology that even the Print Media is going Video on their websites. For this reason it’s really important that you have your 1 to 2 minute summary about Laughter Yoga ready. How it started, why it’s so good for us, how it works, where it is at present, and just as importantly where it’s going. From this the media will take what it wants and portray us in a very positive way. Thanks to all of those who participated. The Make A Wish Foundation saw it as a great success and will want to do it again next year for sure. Our next major event will be World Laughter Day. It is being held on Sunday the 1st May. Once again this is a GRRREAT opportunity for us to get together and promote our Vision of World Peace through Laughter. With the current unrest throughout the world at present we have a great opportunity to get our message out there with this event. All of the details for each state are on the LYOZ website http://www.laughteryoga-australia.org/. I am delighted to announce the start of another Laughter Club. Jen Smith (a long time Laughter Yoga friend) has started a club in Maclean NSW. Well done Jen. I hope this inspires others to follow your lead. People often ask me how I get paid $1500 or more for a Laughter Yoga presentation when they only get a few hundred dollars if they’re lucky. Having owned and operated my own businesses for more than 30 years, and now as a professional speaker, I find it easy. For this reason I have created a one day Laughter Yoga Business Training Program which enables you to learn some of these ideas. I will be running it on the Monday after the Conference. Why not come along and join me. If you’d like some more details on the content send me an email at mervneal@laughteryoga.org. Enquiries have started to come in to present at the Conference also. If you have a story to tell about your journey and experience with laughter Yoga the Conference is a great platform to do this. Just send me your details and a brief outline of what you would like to present and we’ll put you on the Agenda. We now have a Booking and Registration Form on the LYOZ website. This form has the details of all of the events being offered and prices. As there is limited on site accommodation I recommend you get in early to avoid disappointment. This entry was posted in Merv's Blog and tagged australia, best medicine, laugh, laughter club, laughter yoga, world laughter day on April 5, 2011 by Sebastien Gendry. World Laughter Day is on May 1st! We are open to trades! What are you interested in? Laughter Professionals Online Training: Coming soon. 2011 All America Laughter Yoga Conference: It’s slowly taking shape! See the current tentative agenda here. All Laughter Yoga News On One Page: very convenient. Affiliates Program: Make money while you sleep. Happy Songs Directory: 100 videos, chords & lyrics. Laughter Yoga Downloads: Useful stuff. All free. Includes the template structure of a Laughter Yoga session the way I do it and more. Laughter Yoga Map: Still in progress. Already awesome (you now have the option to embed any search results on your website! see the bottom of that page for the code to copy). Japanese love Laughter Yoga too! If this doesn’t inspire you to learn guitar, nothing will. TV Ad Sells Thai Cell Phone Network, Teaches A Powerful Lesson: Disconnect Before You Connect! I had to re-organize my 2011 teaching calendar recently. Here are the new dates (all confirmed). All the videos of the 2010 All America Laughter Yoga conference are now available for purchase individually ($12.95 each) or as a pack (12h for $99). This entry was posted in Laughter Insight Newsletter and tagged laughter yoga, world laughter day on April 5, 2011 by Sebastien Gendry. World Laughter Day was celebrated in hundreds of cities this year across in 63 countries on our count (possibly more, and if so we just don’t know about it): all over Western and most of Eastern Europe, North America, Asia/Pacific (Taiwan, China, South Korea, Australia, New Zealand), parts of South America, Parts of North & South Africa and a volley of island nations across 4 of the 5 oceans (Pacific, Atlantic, Indian and Southern). This entry was posted in Laughter News and tagged world laughter day on May 3, 2010 by Sebastien Gendry. We’re organizing the 2010 All America Laughter Yoga conference and its line-up of presenters is already astounding us (see below as well). Happy New Year to you all! (I created 2 special cards for you here andhere). It’s never too late to say that we care. The American School Of Laughter Yoga has a new website!We’re only 40% finished with it and it’s already more comprehensive than 99.9% of everything there is out there on the use of laughter as an exercise and healing modality. World Laughter Day is on Sunday May 2nd: start thinking about it. Your celebration does not need to be a massive event. This is about energy and intention more than anything else. And yes, you laughing alone for 5 minutes on that day if that’s the best you can do will make a difference. More about this in our next newsletter. How to break a Guiness World Laughter Record, Hasya Yoga as a Spiritual Practice, Laughter Yoga With ADD and Dyslexia, Laughter Yoga as a Conflict Management Tool, Laughter Coaching, Laughter Yoga in Integrative Medicine, and more. We’re in Miami, Florida, this coming week-end! (February 6-7). You can still register. Please email us at laugh@laughangeles.com if you live locally and can host people, or if you are traveling and are in need of a place to stay. It’s superbowl week-end and superbowl is …. in Miami this year. See our full training schedule here. This entry was posted in Laughter Insight Newsletter and tagged laughter yoga, world laughter day, yoga conference on February 2, 2010 by Sebastien Gendry.